Ages: 3 and Up! With adult help of course! • Something clear or shiny for the water… like seran wrap or tin foil. 1. Have each child lay down on a large sheet of paper. Make sure they are wearing a fireman hat and holding something that looks like a hose. Tell them to pretend that they are really spraying water on a fire - so that they are positioned the right way. Trace around their body, hat and hose. Once they have stood up from their outline, they, or an adult will need to draw in the other features (this takes a little artistic work). 2. Paint the firefighter figure with regular tempera or acrylic paints and let dry. 3. To make the building simply tape or staple sheets of construction paper on the wall to form a rectangle. Cut out rectangle windows and any other features you would like. 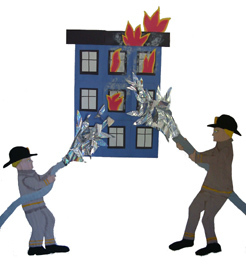 Use red, orange and yellow paper to cut out flames and attach to the building. We added a little extra touch by using gray paint to show smoke coming from the flames. 4. Make water to come out of the hoses by cutting strips of seran wrap and/or tinfoil. Secure in place.